BRIGANTINE / TOMS RIVER – Standing in the ocean with the waves gushing and swirling around her feet, Grace Rice found it hard to believe the very same water could turn violent enough to wipe out the home she had spent the day working on. 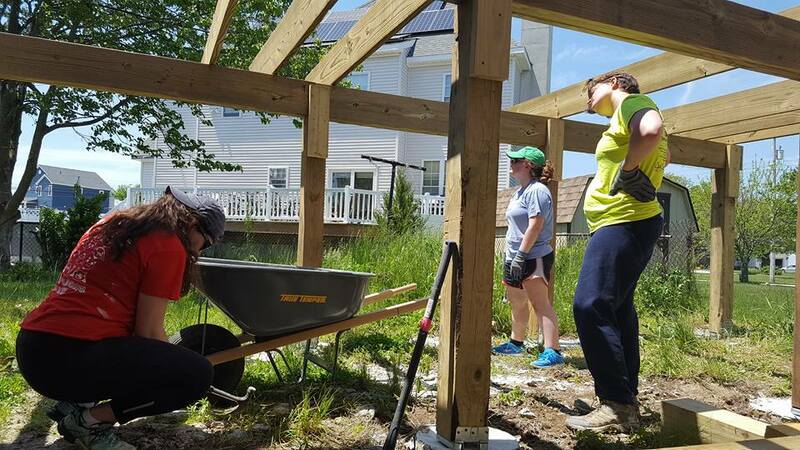 Last May, Rice was one of five students and two leaders on a mission trip to help with A Future With Hope’s Superstorm Sandy recovery efforts in Brigantine and Toms River. The group from Campus Christian Community at the University of Mary Washington in Fredericksburg, VA, spent a week painting, spackling, reflecting, and praying; grappling with the challenges of the ongoing rebuilding process at the Jersey Shore. Waite described meeting one of the home owners as a moving part of the experience. The energy was contagious for the group, leaving New Jersey “grateful” and “inspired.” In the midst of their work, the group members were given a list of questions designed to help them get to know each other and go deeper in their faith. Rice expressed frustration at the start of the trip because she felt the group’s work didn’t seem “big or important” but later came to appreciate what they had done after seeing the happiness in the families they had helped firsthand. “Leaving New Jersey encouraged me to work on putting others before myself and to continue being a light,” she said. Katie Hartraft said the mission trip was the best conclusion she could have ever had to her freshmen year of college. For a while, Hartraft had debated on going on the trip. “It was a much more fulfilling experience than I had previously imagined,” she said.